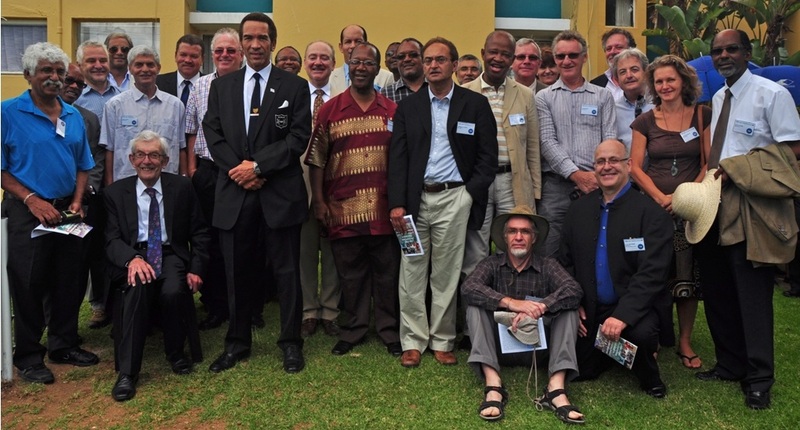 3 February 2013 marked 50 years since Waterford Kamhlaba United World College opened its doors in Swaziland for the first time. As a past student and present governor this is going to be a busy and significant year. We are planning to mark the anniversary in a number of ways over the next 10 months. One of the key targets will be to ensure that we have enough money for the school to continue for the next 50 years. A central value is to provide scholarships to deserving students. Currently about 30% of the children are recipients of such support. The link to the school website is in this posting and I do hope people will take a minute to visit it. The first Waterford event, on the weekend of 2 and 3 February was so much fun. I flew into Swaziland on the Thursday evening and spent the morning with my friends at The National Emergency Response Council on HIV/AIDS (NERCHA) in Mbabane, and the afternoon at the school. The next morning events were scheduled from 11am to 2pm. I drove up early to avoid security. It was reported that there would be 80 Swazi security personnel, I am not certain if this was true. There was a Royal Swazi police van in the parking area with “Bomb Disposal Unit” written on the side, and lots of uniformed men with automatic guns wandering about. The security is part and parcel of having the president of a country coming to visit, even if he is an old boy. The president is Ian Khama who was two or three years ahead of me at school. I gave one of our founding trustees, Martin Kenyon, a ride from the hotel. We then hung around until just before 11am when we were asked to go into the hall. Past copies of our school magazine were on display in the community service room. 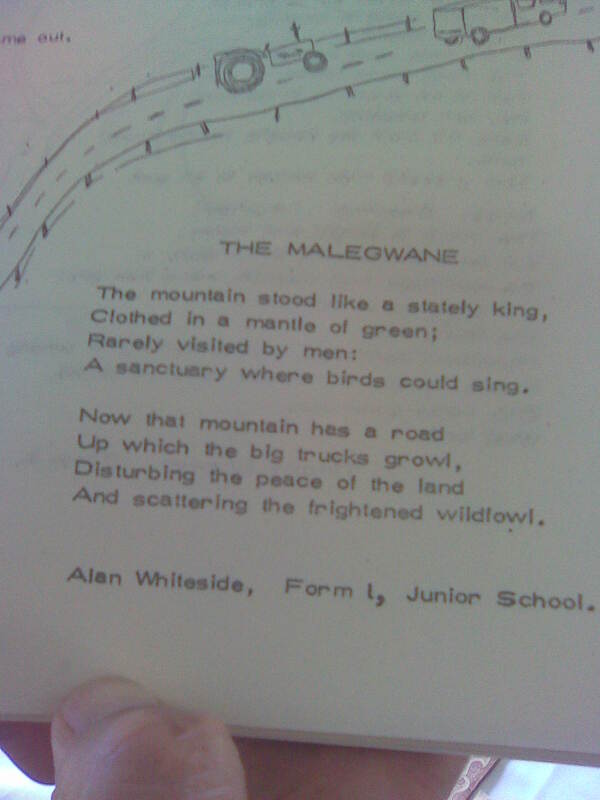 Flicking through them I discovered a poem I had written at about age 12. It confirms that my ability to write poetry, draw, or indeed to engage in any artistic pursuits is limited by a lack of talent. Judge for yourself ! 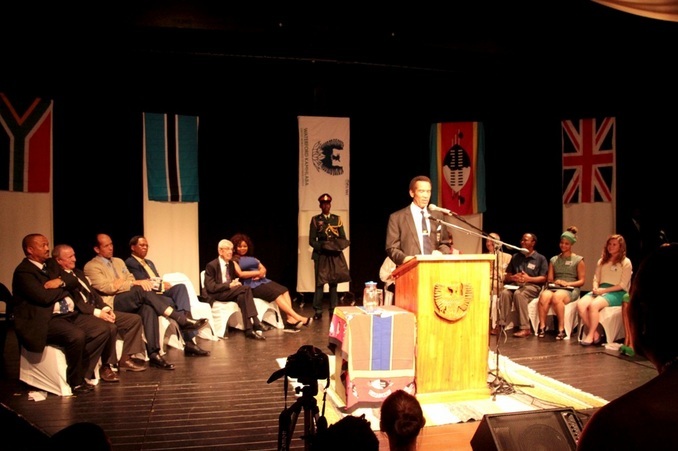 Ian Khama was taught by our guest of honour Tony Hatton, one of the teachers responsible for establishing Waterford. His book Phoenix Rising: A Memoir of Waterford Kamhlaba’s Early Years had been published just in time for the event. This is reviewed at the end of this blog. There were lots of people wearing smart uniforms with stars, medals and gold braid. Also present was the Deputy Prime Minister of Swaziland Themba Masuku whom I have known for many years. He started his career in the Ministry of Agriculture, held various ministerial posts and worked for the FAO. It was a fantastic day. Ian Khama gave a brilliant tribute to Waterford and Tony. He began by talking to the students. He asked them if they had to go to church. Did they have to go to the classrooms and write the weekly letter to their parents on a Sunday? Were they allowed to enter the hall though all the doors? Did they have divinity lessons? A chorus of ‘no’ from the students present (except for service we all have to do it – but in our day it was physical labour – today it is community service). His masterstroke was to ask: did they have to wear uniforms? The answer was no! A uniformed man came from behind him carrying a jacket holder. He took out a Waterford blazer and then taking off his jacket put it on. It was a really wonderful moment and you can see bits of it on Facebook. There will be a weekend of celebration at the end of April when the school is hosting a symposium. The guest of honor will be Archbishop Desmond Tutu. This will be followed by a series of reunions for alumni. Those who attended in the 1960s and 1970s will have the opportunity to return to the school and sleep in their old dormitories on the weekend of 9-11 August. I have a real sense of incredible good fortune to have been educated at this school with the principles and values it inculcated in me. I was there because it was the local school, so many of my classmates battled to attend for financial and political reasons. I remember one having his passport refused by the apartheid officials in an act of pettiness that was so typical of the time. Indeed Tony Hatton was banned from traveling into South Africa for many years. This will seem like ancient history for the current cohort of students, but they too will certainly face numerous serious challenges. These will include employment, the environment, inequality and poverty, and new diseases such as HIV and AIDS. Indeed I have taken to avoiding the local spa in Durban on a Tuesday. It is the day they offer a 5% discount for pensioners, and I don’t like being asked if I qualify. Back in Durban it has not been as hot as I would have expected in February. I have had to use my air-conditioning units on just three or four occasions. Although it must be said I am very glad I have them. There has been a great deal of rain and gray skies and I have not yet had the chance to get to the beach. On Saturday I was invited to the Rumbelow Theatre in Umbilo. This is a working-class suburb and is where we first bought a house in Durban. The company uses a MOTH Hall. MOTH stands for the Memorable Order of the Tin Hats and was established after the First World War as an ex-serviceman’s club or community. The hall is extremely basic and has flags, maps and memorials on the wall. The show Suspects of Love consisted of four flamboyant men in drag miming to the words of love songs. It does not sound that promising but in fact was great fun. The Rumbelow has a great website. I really enjoyed reading this book. Because we lived in Swaziland, I felt that I knew something about the history of the establishment of Waterford and its early years. I was there as a student from 1969 to 1974 so lived through that period. The book is one view of what went on and is a valuable record. It is more than that though: it is well written, humorous and thought-provoking. I had seen an early first draft of the manuscript many years ago and know a little bit of the back story of getting it published in record time. Well done to Tony for writing it, my colleagues Catherine and Gwythian for putting it together, getting it printed and published and down to Swaziland in time for the weekend. It can be ordered from the school website. For those who went to Waterford do buy it, for people who are interested in the history of the school and the region it is a good read. This French-Canadian film is the story of a man who is a sperm donor and fathers 533 children. He believes that he will be kept anonymous, but about 150 of them enter a class action to find out the identity of their father. The story centers on their attempts to find him while he seeks to retain his anonymity. At the same time, his girlfriend is pregnant with his child. An additional part of the plot is his relationship with his father and brothers who run a butchers shop. It is not a deep or meaningful film. It is light and enjoyable. The dialogue is in French with English subtitles. It is an example of the quality films coming out of Canada. The in-joke, which is beyond non-Canadians, is that Starbuck was a prize bull used to inseminate thousands of cows, something Canadians know. This computer-animated fantasy film is set in Scotland many centuries ago. The daughter of the King, Merida defies the age-old custom of marrying the son of a local chief and causes chaos. She heads into the forest and consults a witch for help. The result is her mother is turned into a bear and the story is about her putting this right. The voices I recognised were Julie Walters, Billy Connolly and Robbie Coltrane. It was good fun and technically brilliant. It won the Golden Globe Award for Best Animated Feature Film and BAFTA Award for Best Animated Film. This entry was posted in Blog and tagged Archbishop Desmond Tutu, BAFTA, Deputy Prime Minister of Swaziland Themba Masuku, Golden Globe, Ian Khama, NERCHA, Pixar, Royal Swazi, Waterford Kamhlaba School. Bookmark the permalink.